Abstract: This article sheds light on the contributions of high school student activists in the environmental movement of the 1970s. Specifically, it focuses on the Nissequogue Environmental Committee (N.E.C), a Long Island-based environmental group consisting of students from Saint Anthony’s High School in Smithtown, New York, whose members committed themselves to the preservation of the Nissequogue River from the group’s inception in 1970 to its final year in 1979. 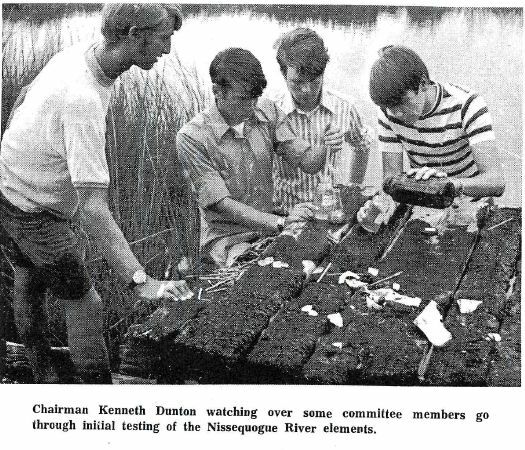 Under the leadership of Founder and Chairman, Kenneth Dunton, N.E.C members utilized their varied and specialized science backgrounds in the hopes of preserving the Nissequogue in its “natural state” for future generations. Their efforts would ultimately result in the rivers’ inclusion under New York State’s 1972 Wild, Scenic, and Recreational Rivers Act. Shakespeare alleged that “what’s past is prologue.” If this is true, then millennial ecological concerns such as those unveiled in recent films ranging from Al Gore’s award-winning An Inconvenient Truth to Gregory Greene’s The End of Suburbia: Oil Depletion and the Collapse of the American Dream and Laura Dunn’s The Unforeseen, are not new to popular discourse. While such projects have once again popularized environmental protection campaigns on a local, national, and even global scale, we must recognize, particularly as we look forward to the fortieth anniversary of Earth Day in April of next year, that our contemporary environmental consciousness is an inheritance from previous generations, and not merely a creation of our own. Our benefactors, however, experienced and molded their gift to us in a plethora of ways; while many labored to abate global concerns such as population surpluses and over usage of natural resources, countless others focused their efforts in their own communities and, quite literally for some, right in their own backyards. Interestingly enough, many of these backyards have now become our own. Our inheritance, as local Long Islanders, has been a landscape that, despite having been modified by the bulldozer, has also been safeguarded, particularly in the years following World War II, by local environmental activists and eco-friendly organizations. While the majority of these activists were members of socially and politically-recognized, adult-led organizations – including, among others, the Long Island Environmental Council and the Brookhaven Town Natural Resources Committee which later became the Environmental Defense Fund – others were not, as local teenagers also participated with, and formalized their own, environmental action organizations in their high schools. 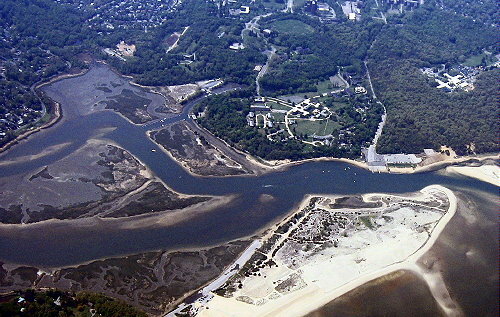 While Long Island became the laboratory for several teen environmental organizations in the late 1960s and early 1970s, a small number of them were able to not only call attention to ecological degradation, but also inspire local residents as well as local and state politicians to amend local practices and work for environmental protection. 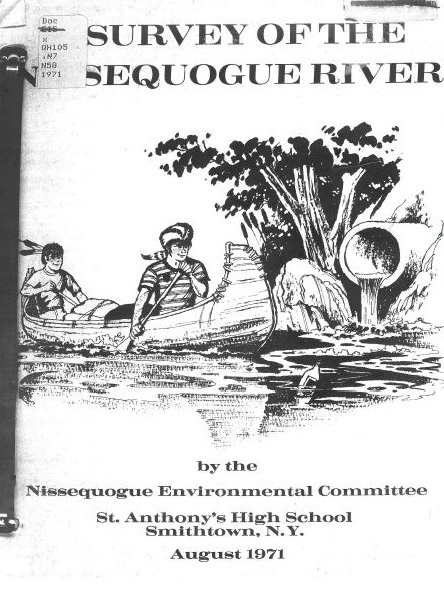 The Nissequogue Environmental Committee (N.E.C) from Saint Anthony’s High School in Smithtown was one such activist group. Figure 2: Photograph by Susan Tiffen. Used with Permission. Founded in 1970, N.E.C. 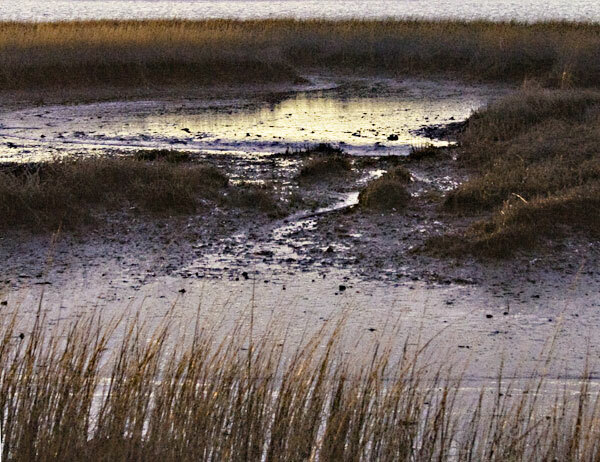 members committed themselves to the preservation of Long Island’s roughly eight-mile Nissequogue River, which flowed behind their high school, from Smithtown north to the Long Island Sound. From 1970 to 1979, N.E.C. members logged countless hours along the Nissequogue, testing its waters for ecological impurities and inorganic pollutants. In addition, N.E.C members thrice published their findings for public consumption, offered copies of their reports to school and local libraries, and presented their findings to state and local politicians, as well as to various local environmental and political organizations concerned with the river’s preservation. Despite N.E.C members’ youth, this high school student environmental organization proved to be extraordinarily effective in calling attention to the pollutants in and around the Nissequogue River. While the N.E.C. was not the only local organization to advocate for state protection of the river, the group’s research, findings, and reports provided the scientific foundation any such movement would require. Despite the wealth of academic analyses of environmental activism on Long Island, New York State, and the nation on the whole, high school student environmental activists have remained almost entirely absent from the historical narrative. While scholars such as Samuel Hays, Hal Rothman, Kirkpatrick Sale, and Adam Rome have published necessary treatments of the twentieth-century environmental movement, they, as well as most practitioners in the field, have not unveiled the hidden histories of the high school environmentalist. In the few instances that such activists have been credited for their contributions, as they are in historian Robert Gottlieb’s Forcing the Spring: The Transformation of the Environmental Movement and Matthew Gandy’s Concrete and Clay: Reworking Nature in New York City, scholars have mentioned them only in passing, often focusing their attention on student-led environmental justice and anti-toxics campaigns of the 1980s and early 1990s. The existence, however, of N.E.C, as well as such groups as Students for Environmental Quality in Bellport, Students Against Violence to the Environment in Farmingdale, and the John Dewey High School Marine Biology Club in Brooklyn, to mention only a few, illustrates that high school student environmental activism flourished in the years following the first Earth Day in 1970. The history of the N.E.C.’s Nissequogue River project will begin to fill this unfortunate void not only in the literature on the Environmental Movement, but also in the literature on post-World War II high school student activism. While teenaged activists have been the foci, in recent years, for scholars such as Gael Graham and Dionne Danns, neither one has examined high school student environmental activism. These scholars have offered a wealth of information on student involvement in movements such as Civil Rights, free speech, women’s liberation, and anti-war; however, their analyses have neglected to recognize student environmental organizations such as the N.E.C. A mosaic of post-World War II high school student activism cannot be made complete without an examination of organizations of this breed. Figure 3: Kenneth Dunton, N.E.C. Founder and First Chairman, Then and Now. Used with Permission. It’s a basic tenet of science, besides hypothesis testing, it’s just observation. I think back then a lot of lifeguards didn’t know it, but they became in a sense, Marine Scientists, just because they learned so much just by being around the water. With the Nissequogue situated directly behind Saint Anthony’s High School, Dunton’s interest in the river evolved organically. For him, “it looked like an interesting river system” which he could observe and test in his leisure time. As he explained, it was his natural curiosity that first sparked his interest in the Nissequogue; he never intended to organize his peers and form the N.E.C. Dunton’s curiosity, however, quickly led to a genuine concern for the Nissequogue’s health and natural aesthetic. While canoeing up river Dunton discovered several sources of ”anthropogenic inputs that didn’t belong there” including “sewage, [and] in some cases pipes that were delivering God knows what” into the water. He soon realized that such inorganic materials would and could clearly alter marine bacterial levels, and not only endanger wildlife in the area, but marine life as well. He also recognized that if appropriate actions were taken, and the pollutants were eliminated, “the natural flushing of the tides [would] clean that system up so the river [could] regain its economic value in terms of the fishery.” At the same time, Dunton, still only a senior in high school, realized he would need assistance if he was to accomplish anything. Fortunately, Saint Anthony’s High School put him in close contact with a host of college-bound teenagers, many of whom he knew shared his interest in the natural environment. Dunton recalled, “back then I wanted to get a group of people together, my colleagues at Saint Anthony’s, I thought, would be really interested in going out and working with me doing chemistry and biology in terms of censusing the plant and animal life and looking at the chemistry of the river”. In the fall of 1970, he spread word of his intentions and hoped for the best. Figure 4: Photograph by Susan Tiffen. Used with Permission. By the end of October, his quest to enlist fellow students had brought together a core group of twenty teenaged boys with interests and experiences in various scientific disciplines. Early on, Dunton realized that for a fledgling association of twenty members with disparate academic pursuits to be most effective, N.E.C. would need to be organized in a manner that efficiently utilized each member’s scientific expertise. To this end, members joined one of five field-specific sub-committees, including the Bacteriological, Geological, Bio-Chemical, Ecological, and Public Relations Committees. Each of these five sub-committees was led by its own chairman who was to be responsible for reporting his committee’s findings to not only his fellow N.E.C. members, but also to the group’s four governing officers. In the fall of 1970, Dunton was the obvious choice for Chairman, even though he was scheduled to graduate that spring. Recognizing that the N.E.C. would more than likely endure long after his graduation, Dunton chose to groom freshman classmate Daniel Sulmasy as his successor. As Dunton explained, Sulmasy was “a natural” heir to the Nissequogue River Study. Daniel Sulmasey was one of those really sharp kids that was already in the top ten percent of his class and, you know, already had the right attitude and interests and brains, basically, intelligence to carry this forward. So, he became a natural successor to this whole project, I mean, he and I worked really closely in my senior year. As an Assistant Chairman of the N.E.C. and Chairman of the Bacteriological Committee, Sulmasy was young enough to eventually carry the group forward when he would become Chairman for the 1972-1973 academic school year. Nevertheless, from 1970 to 1972, Dunton and his junior classmate, Assistant Chairman Scott McNamara, would lead the N.E.C, in its first two years, respectively. If you did this it was going to end the world within our lifespan. If not, shortly thereafter. And many of us were committed to trying to preserve what we had. We had the Nissequogue River right there, that was beautiful, that we could fish in, that we thought with continued pollution it was going to be to the detriment of the river and the community. Like most Saint Anthony’s students, however, McNamara did not live in Smithtown, where the school was located, nor did he live anywhere else along the river. Unlike public school children who often attend schools in close proximity to their homes, parochial school children typically travel to school from disparate regional communities. Saint Anthony’s High School was no exception. As McNamara explained, the “school drew students from as far in as Mineola all the way out past Saint James, and from the North Shore to the South Shore” .Interestingly enough, while youths from other high school environmental organizations, such as Students for Environmental Quality in Bellport, labored to protect rivers and streams that flowed through their communities of residence, N.E.C members shared a different experience. For them, Saint Anthony’s High School was, on one level, a community unto itself. With this in mind, it is no wonder why N.E.C. members “were pretty gung-ho” and anxious to “save the world,” when the Nissequogue River, a small part of that world, flowed past their Smithtown high school property. 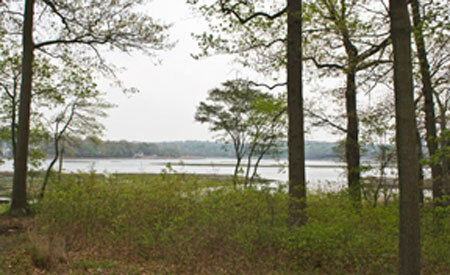 The N.E.C was not, however, the only local organization concerned with preserving the Nissequogue River. In addition to various Smithtown residents, the Smithtown League of Women Voters (L.W.V) and the Smithtown Conservation Advisory Council (S.C.A.C) also labored to protect the local waterway. 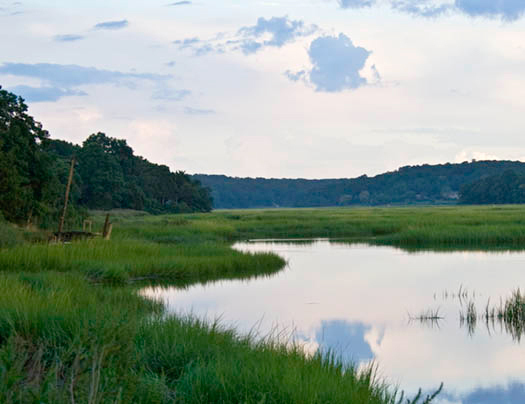 Throughout 1967, League members conducted an extensive river study framed around six key questions encompassing topics such as the river’s value to Smithtown residents, the benefits and/or drawbacks of dredging, legal protection for the river, and arguments for and against development. The L.W.V sought to understand if the river should “be developed for recreation,” “preserved in its present relatively natural state” or, if “both interests which are vital to man [could] be served mutually?” While the group’s fact sheet only offered the pros and cons for each of their queries, the report stressed the anthropomorphic and chemical pollutants that had, and would continue to, endanger the Nissequogue if development occurred. While pollution levels in some areas of the river had decreased since the early 1950s, the report indicated that “pollution still exist[ed] in the mouth of the river” and as of September 1967, the New York State Department of Conservation was still “seeking to locate the source.” N.E.C. members’ bio-chemical testing of the local waterway would lead to that source just four years later. The students’ intentions and efforts were well received and more than encouraged by the L.W.V as well as by the newly created Smithtown Conservation Advisory Council (S.C.A.C). Established in late 1967 to “advise in the promotion and development of town natural resources,” “conduct research into land area of the town” and to “coordinate activities of unofficial bodies organized for similar purposes,” S.C.A.C not only offered enthusiastic moral support to the nascent environmentalists, but also loaned them the water analysis gear to conduct their research. In addition to S.C.A.C’s support, N.E.C. members also benefited from the expertise and advice of Dr. Charles Hall, a local biologist from Brookhaven National Laboratory and an Ecology Professor at Cornell University, Stephen Pradon, a Smithtown Wildlife Naturalist, and Anthony Taormina, Suffolk County’s Supervisor of Fish and Game for the New York Department of Environmental Conservation. With Saint Anthony’s science equipment at their disposal as well as the support of those listed above, N.E.C. was well suited to begin their study . . . in early of 1971. Their findings, however, would lead to contestations between the students, administrators at Saint Anthony’s High School, and local businesses located along the Nissequogue River. 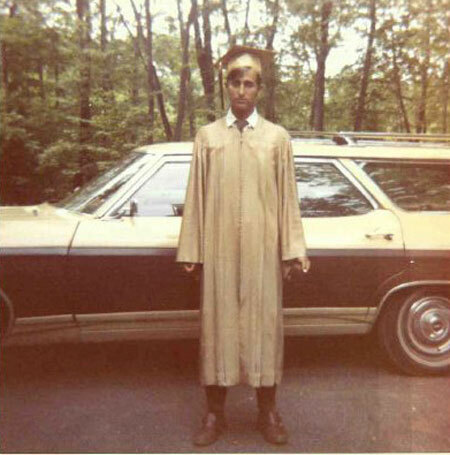 Unlike the millions of American high school students who relish their three-month summer vacation as a time to recover from and prepare for the academic year, Kenneth Dunton spent the summer of 1970 at the State University of New York at Stony Brook studying Marine Science. While many of his peers used their time recreationally, Dunton spent this summer fomenting his love of marine life, not only as a lifeguard, but also as a blossoming scientist by learning how to sample, test, and analyze water. As Dunton explained, the course, and what he learned from it, partially inspired his initial foray onto the banks of the Nissequogue. More importantly, this experience at Stony Brook introduced him to scientific means and methods uncharacteristic of a 1970s high school science classroom, which he and his N.E.C. peers were able to employ in their study. We ended up doing the kind of chemistry that a lot of students don’t see until they are in college now. For sure, like dissolved oxygen; actually titrating water samples and measuring dissolved oxygen. That is unbelievable that we did that as fifteen year olds and sixteen year olds. In fact, the pictures that are in the newspaper actually show pictures of us; I can see the D.O.D. bottles on this table and here we are using very highly concentrated acids and bases to titrate dissolved oxygen. It’s just unbelievable. We’re not even wearing goggles, masks, gloves, anything. In March of 1971, N.E.C. members began to apply this sophisticated lab-based knowledge to the river, and spent the next several months sampling and testing the river water for organic and inorganic pollutants. N.E.C. members determined, however, that private homes and private waste were not the main source of water pollution, even though both threatened water quality. The presence of “domesticated ducks” along the river at the Landing Avenue Park, as well as the proximity of Smithtown’s Porterhouse Riverboat Restaurant in relation to the waterway appeared to be the more likely suspects, especially from an unbiased, environmentally-conscious perspective. The students’ conclusions indicated that duck droppings had “caused Coli form counts to increase greatly over what private homes alone would cause.” Moreover, the mean average Coli form count (at 4,625) near the Porterhouse Riverboat Restaurant (incidentally located next to another duck pond) “exceeded all health standards by over 4,000.” Even though, as N.E.C. members asserted, “pollution was not a serious problem” in the river’s lower region, their findings indicated that the upper portions had become jeopardized. These astronomical pollution levels prompted the committee to recommend swift local action in defense of the river. To this end, members offered three recommendations in their fifty-five page report for Smithtown officials to consider. This included: “a thorough investigation” of the Porterhouse’s “waste disposal system” and a reexamination of its “health and various licenses by county officials;” a reduction of “domesticated ducks” by the Smithtown Parks Department; and, an investigation of all “dredging and landfill projects adjacent to the river” by town officials to ensure their absolute necessity. In addition to publishing these recommendations and their research findings for public consumption, N.E.C. members’ also relayed their discoveries to local newspapers, which published several articles regarding the organization, their study, and their findings, including their allegations against the Porterhouse Riverboat Restaurant. These allegations were not well received by the restaurant’s management who, with support from Edwin Werner from the Suffolk Environmental Control Department, reported that the “restaurant’s cesspools and pumps [were] in perfect condition and that the water [was] clean.” Nevertheless, as Daniel Sulmasy explained, the N.E.C. had “traced” the high levels of Coli form bacteria “back and actually found that this restaurant had placed cesspools into a marsh which was leeching raw sewage which was just draining out into these little rivulets which went right into the river.” Moreover, the restaurant’s cesspools had, “for some time,” been of concern to S.C.A.C and local Smithtown officials since they were “too close to the river to allow for proper soil filtration before seeping into the Nissequogue”. Despite the N.E.C.’s evidence and local concerns, however, Saint Anthony’s administrators, who had initially supported and summarily congratulated the students for their efforts, found themselves in a quagmire regarding the allegations. As it turned out, Saint Anthony’s High School and the Porterhouse Riverboat Restaurant were closely associated with one another, as Sulmasy made clear. I can tell you that this then got us into some significant trouble, because it turned out that the restaurant gave a lot of money to our school, Saint Anthony’s, and the restaurant owner threatened the principal that he was going to stop giving money. And in the days of the 1970s, I guess we were brought into the principal’’ office and told that they were going to cut off funding for us. We felt that this was unconscionable and that, you know, a good Franciscan institution should take the environment seriously. Saint Anthony’s did, however, value the time and effort N.E.C. members had put into the project, and rather than force the students to disband or publicly rescind their report, the school only asked them to look elsewhere for financial support and official recognition. For this, N.E.C members turned to the local community, S.C.A.C. and Suffolk County officials. Speaking to Garden Club members and visiting with local Nissequogue residents proved a fruitful means of private fund-raising. On one occasion, N.E.C. was afforded the opportunity to present their concerns in the home of County Executive John V. N. Klein, who “land[ed] in a helicopter from Riverhead while we were addressing the Garden Club.” Exposure and audiences such as this not only secured the necessary financial assistance N.E.C. needed to continue its research, but it also garnered the students’ official recognition and a sense of legitimacy. Local officials were so impressed with N.E.C.’s work, that Daniel Sulmasy, N.E.C.’s Chairman for the 1972-1973 school year, was eventually appointed to S.C.A.C by Smithtown’s Town Supervisor in 1973. This position afforded N.E.C. members another layer of credibility as they continued to study the Nissequogue and publish their findings throughout the 1970s. Figure 9: Photograph by Susan Tiffen. Used with Permission. With the publication of their first report in November of 1971, however, N.E.C. members quickly realized that their work had only just begun. For them, it was clear that more research, sampling, and analyses, as well as new recruits, would be required if the Nissequogue River was to be protected and preserved. With Sulmasy at the helm, as Dunton had predicted, N.E.C.’s work was, in fact, able to continue long after Dunton and McNamara had graduated. As N.E.C.’s third chairman, Sulmasy led the group through its second round of testing from 1972 to 1973, and oversaw the publication of its second report, published in November of 1973. A third report followed four years later. According to the N.E.C.’s second publication, while the river water was “generally” free from impurities, “severe bacteriological pollution” was still present “in the waters adjacent to the Porterhouse Riverboat Restaurant.” N.E.C. once again linked the high coli form levels to the restaurant’s “leaking above-ground cesspool system.” Moreover, the N.E.C’s analyses of the cesspool “confirm[ed] that the liquid which flow[ed] from the cap [was] without a doubt raw sewage.” Again, N.E.C. alleged that this sewage flowed directly into, and therefore had contaminated, the Nissequogue River. In the group’s 1977 report, however, the students reported that coli form levels in the same area had significantly decreased, appearing “very seldom” if at all. These latter findings prompted N.E.C. members to conclude that, by 1977, the restaurant’s “cesspools [were] no longer polluting the river.” Clearly then, it is safe to assume that at some point between the N.E.C’s publication of its second and third river reports, the Porterhouse Riverboat Restaurant must have mended its faulty cesspool system, which led to the lower coli form counts. With few, if any, detectable organic and/or inorganic impurities left in the Nissequogue River, the N.E.C. officially disbanded in 1979, having accomplished its founder’s mission. That didn’t necessarily mean, however, that the local waterway would be shielded from development and pollution in the years ahead. Indeed, only its inclusion under New York State’s 1972 Wild, Scenic and Recreational Rivers Act (WSRRA) could guarantee the Nissequogue the level of protection needed to sustain it for future generations. The first step towards this ultimate goal had been taken in 1974 with the river’s partial incorporation into New York’s State Park System. 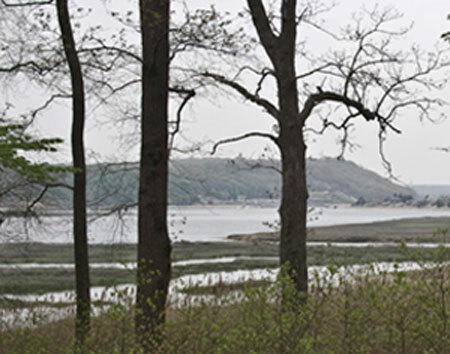 With the opening of the Nissequogue River State Park on April 1 of that year, roughly 600 acres of undeveloped land along portions of the riverbank were to be preserved in their natural state for recreation as well as maintenance of native flora and fauna. Just three years later, as N.E.C. members were drafting their third and final report, the New York State legislature in Albany designated the Nissequogue a “study river” to be analyzed for possible future inclusion under the WSRRA. 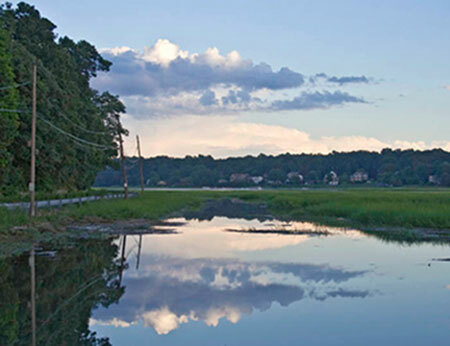 By the middle of the following decade, the Nissequogue River would be included under the act, due in large part to the research conducted by and the public support garnered by the N.E.C. Ironically, what began as one high school student’s quest to satiate a curiosity, ultimately inspired a group of twenty high school students to begin a movement to save a river. Figure 10: Photograph by Susan Tiffen. Used with Permission. In The Greening of a Nation ? : Environmentalism in the United States Since 1945, the late Hal Rothman argued that “Americans have shown a tendency to be ‘green’ when it is inexpensive – economically, socially, and culturally – but a reluctance to collectively sacrifice convenience and even the smallest of material advantages to assure a ‘cleaner’ future.” In Rothman’s estimation, this “paradox” has plagued American society and, by extension, the post-World War II American Environmental Movement. In the present age, Rothman’s sentiment still holds true for many sectors in our society. For many, environmental protection is but an afterthought, only rising to prominence as An Inconvenient Truth Americans are willing to hear, but not act upon. For the rest, personal sacrifice and environmental action reek of futility, as a wasteful American consumer-driven society devours natural resources while at the same time contradicts itself by celebrating Earth Day every April 22nd. The exception, however, has been the thousands of high school student environmental activists and high school environmental activist groups like the N.E.C. 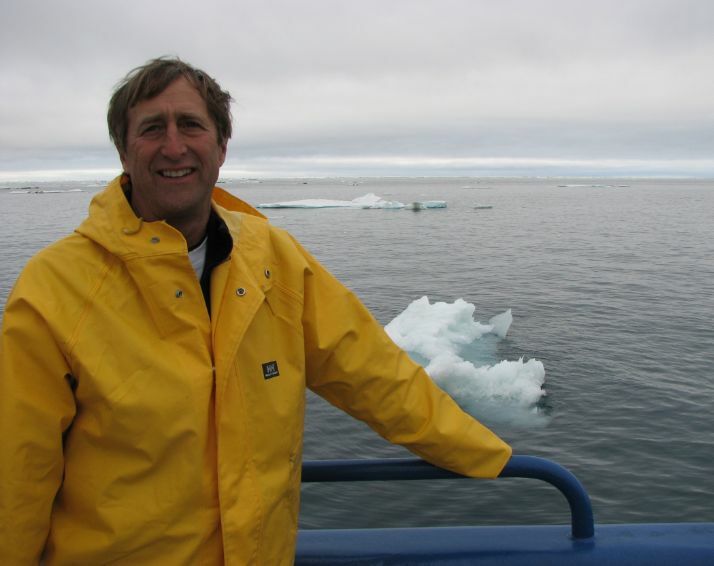 Unlike many of their parents, teachers, and other adult neighbors, high school student environmentalists – then and now – transcend Rothman’s late 1990s critique. Unlike adults, including their fellow environmentalists, high schoolers are neither homeowners nor taxpayers, and are not responsible for any expense, be it economic, social, or cultural. While adults, such as those who once owned and managed the Porterhouse Riverboat Restaurant, by economic necessity, have tended to consider financial security and profit before environmental health, high school student activists have not. This state of teenage limbo, where student activists are no longer considered children, but not yet considered adults, allow youth activists to develop their own environmental consciousness, which is unhindered by questions of property rights, tax assessments, and/or profit. Ultimately, this allows them to look beyond the financial anxieties that plague their adult neighbors, and concern themselves more with environmental protection, especially when the fruits of their labor protect the aesthetic and ecological values of natural areas. N.E.C. members of the early 1970s were no different. While Rothman’s critique may indeed be truly indicative of adult Americans, regardless of the era in question, high school student environmentalists have always been able, as the old adage states, to see the forest for the trees. Guided by a desire to preserve natural areas and dismayed by those who have opted for the alternative, high school students, like N.E.C. members, have played a significant role in environmental defense on all levels, be it local, state, national or even global. In the coming years, while adult environmentalists and their opposition in government as well as in the private sector debate the cost-benefit analyses of environmental health, teenage environmentalists across the nation will still organize in-school environmental protection associations, hold Earth Day community clean-ups, begin in-school and community recycling campaigns, promote green living alternatives, and excitedly bring home eco-friendly literature to their parents and neighbors to read. They will understand green areas not as sites for future commercial or private development, but as the natural and vital eco-systems that they are. Profit and indulgence will not cloud their vision as it did not cloud the vision of their forbearers. If we, as adults, begin to see the world as they do, then abatement of our current ecological crises may still be possible. Figure 11: Photograph by Susan Tiffen. Used with Permission. See Philip Shabecoff, A Fierce Green Fire: The American Environmental Movement (New York: Hill and Wang, 1993); Richard N. L. Andrews, Managing the Environment, Managing Ourselves: A History of American Environmental Policy (New Haven: Yale University Press, 1999); Christopher Sellers, “Body, Place and the State: The Making of an ‘Environmental’ Imaginary in the Post-World War II U.S.,” Radical History Review 74 (1999): 31-64. Samuel P. Hays, Beauty, Health and Permanence: Environmental Politics in the United States, 1955-1985 (New York: Cambridge University Press, 1987); Kirkpatrick Sale, The Green Revolution: The American Environmental Movement, 1962-1992 (New York: Hill and Wang, 1993); Hal K. Rothman, The Greening of a Nation: Environmentalism in the United States Since 1945 (New York: Harcourt Brace, 1998); Adam Rome, Bulldozer in the Countryside: Suburban Sprawl and the Rise of American Environmentalism (Cambridge: Cambridge University Press, 2001). Robert Gottlieb, Forcing the Spring: The Transformation of the American Environmental Movement (Washington, D.C.: Island Press, 1993); Matthew Gandy, Concrete and Clay: Reworking Nature in New York City (Cambridge: The MIT Press, 2002). In “‘Give Earth a Chance’: The Environmental Movement and the Sixties,” Adam Rome, like countless environmental historians before him, acknowledges that the movement “attracted million of people in their teens” but does not address high school environmentalism activism directly. See The Journal of American History Vol. 90, No. 2 (2003), 525-554. Gael Graham, Young Activists: American High School Students in the Age of Protest (DeKalb, Illinois: Northern Illinois University, 2006); Dionne Danns, Something Better for Our Children: Black Organizing in Chicago Public Schools, 1963-1971 (New York: Routledge, 2003); See also Jeanne F. Theoharis and Komozi Woodard, eds. Freedom North: Black Freedom Struggles Outside the South, 1940-1980 (New York: Palgrave Macmillan, 2003); Franklin, Barry M., “Community, Race, and Curriculum in Detroit: The Northern High School Walkout,” History of Education Vol. 33. No. 2 (March 2004): 137-156; Gael Graham, “Flaunting the Freak Flag: Karr v. Schmidt and the Great Hair Debate in American High Schools, 1965-1975,” The Journal of American History Vol. 91. No. 2 (September, 2004) pages ? In the early 1970s, several edited volumes were published which provided first hand accounts of high school student activists, including: Marc Libarle and Tom Seligson, eds., The High School Revolutionaries (New York: Random House, 1970); and John Birmingham, ed. Our Time is Now: Notes from the High School Underground (New York: Praeger, 1970). Kenneth Dunton, interview by author, 17 October 2007. Nissequogue Environmental Committee, meeting minutes, circa fall 1970, from the private collection of Daniel Sulmasy. Dunton interview; Nissequogue Environmental Committee, Survey of the Nissequogue River (Smithtown, NY: Saint Anthony’s High School), 1971, Smithtown Public Library and the Frank Melville Jr. Memorial Library, Stony Brook University, Government Documents Collection. Saint Anthony’s High School Yearbook Staff, Anthonian 1972, 119. Scott McNamara, interview by author, 16 October 2007. Neil P. Buffett, A River’s Place: High School Student Activism and Environmental Protection on Long Island, 1956-1974 (unpublished paper, author’s possession). For an excellent treatment of place-experience, see Yi-Fu Tuan, Space and Place: The Experience of Place (Minneapolis: University of Minnesota, 1977). Smithtown League of Women Voters, Nissequogue River Study Fact Sheet (unpublished document) Smithtown, New York, 1967. The Smithtown Public Library. Smithtown League of Women Voters, 10; “Study of River Completed by St. Anthony’s,” Smithtown Messenger (November 4, 1971), 3; “River Pollution Study: St. Anthony’s Students Express Their Concern,” The Smithtown News (November 4, 1971), 11; “HS Students Did Pollution Study of River,” Sunday News (November 7, 1971), 2. 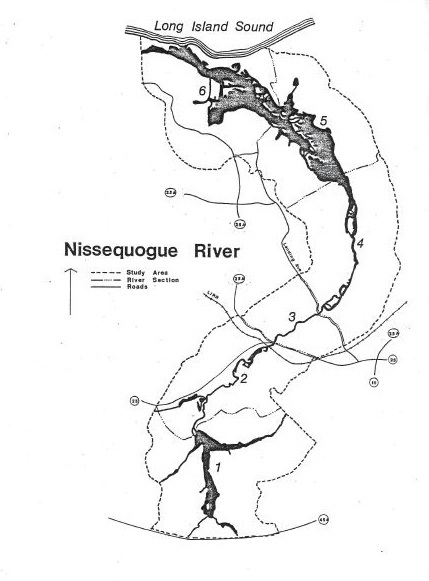 Daniel Sulmasy, interview by author, 12 November 2007); Dunton interview; Nissequogue Environmental Committee, Survey of the Nissequogue River (Smithtown, NY: Saint Anthony’s High School, 1971), vi-vii. 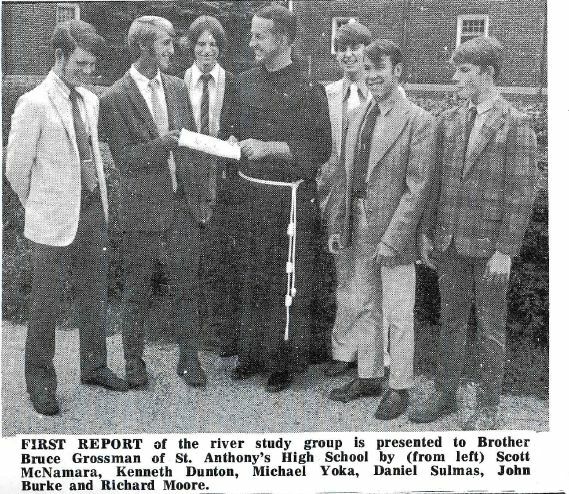 Nissequogue Environmental Committee, Survey of the Nissequogue River (Smithtown, NY: Saint Anthony’s High School, 1971), 5, 30; John Leonard, interview by author, 11 October 2007). Nissequogue Environmental Committee, Survey of the Nissequogue River (Smithtown, NY: Saint Anthony’s High School, 1971), 5, 30. Nissequogue Environmental Committee, Survey of the Nissequogue River (Smithtown, NY: Saint Anthony’s High School, 1971), 30; “River Pollution Study: St. Anthony’s Students Express Their Concern,” The Smithtown News (November 4, 1971), 11; “HS Students Did Pollution Study of River,” Sunday News (November 7, 1971), 2; “Study of River Completed by St. Anthony’s,” Smithtown Messenger (November 4, 1971), 3; Tom Incantalupo, “Beyond the Beer Can is a River to be Saved,” Newsday ( November 5, 1971), 17. “River Pollution Study: St. Anthony’s Students Express Their Concern,” The Smithtown News (November 4, 1971), 11. Sulmasy interview; “Youths Tell How to Save River,” New York Times (March 10, 1974), 94. Nissequogue Environmental Committee, Survey of the Nissequogue River (Smithtown, NY: Saint Anthony’s High School), 1973, ix, found at the Smithtown Public Library. Nissequogue Environmental Committee, Survey of the Nissequogue River (Smithtown, NY: Saint Anthony’s High School), 1977, Smithtown Public Library; “River Making Comeback,” The Smithtown News (March 17, 1977). For more on the WSRRA, see Wild, Scenic and Recreational Rivers System Title 27, New York State Environmental Conservation Law, 15-2701 – 15-2723 found in New York Consolidated Law Service: Annotated Statutes with Forms, Environmental Conservation Law, Articles 15 to 22 Vol. 12A, (Rochester: The Lawyers Co-operative,1982). Nissequogue Environmental Committee, Survey of the Nissequogue River (Smithtown, NY: Saint Anthony’s High School), 1977. Therese Madonia, “Building Banned on the Nissequogue,” The New York Times (July 21, 1985), LI6; “Albany Rules Curb Building Near Streams,” The New York Times (December 8, 1985), 84; see also New York State Department of Environmental Conservation, Nissequogue River: New York State Wild, Scenic and Recreational River System – Summary Study Report (Albany: NYS DEC, 1982). Hal K. Rothman, The Greening of a Nation? : Environmentalism in the United States Since 1945 (Fort Worth: Harcourt, Brace, 1998), 5.